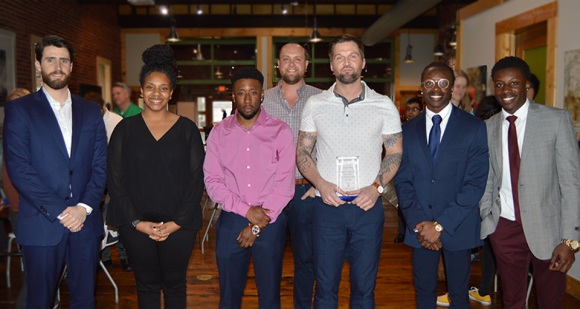 The Jerry McGuire UNCG Student Entrepreneur of the Year Award is an annual $1,000 award going to UNCG’s most entrepreneurial student or student team. Since this award was established, this was arguably the most impressive and diverse group of nominees we have seen. So much so that we invited 5 finalists to be recognized this year. While all were worthy of the award we could only choose one, Our Student Entrepreneur of the Year Award goes to Taylor Mabe. John Barclay – John Barclay is a Marketing major scheduled to graduate in Fall 2019. While a fulltime student last year, he started his own Advertising Agency and Marketing Consulting group called Marley Wayne Company. Since starting Marley Wayne, his list of clients across the triad has continued to grow, including contracts with Small Batch Brewery, Burger Batch Restaurants, Swell, Dolon Enterprises and this summer’s Pig Pickin’ Cook Out Event primarily managing public relations and social media campaigns. His most recent client is a Hotel and Restaurant called Las Olas located in Playa Hermosa, Costa Rica. While attending UNCG, John has consistently been on the Dean’s and Chancellor’s Lists while working a upwards of 25 hours a week and taking a full load of classes. At the end of this month, he will be competing in the National Collegiate Sales Competition at Kennesaw State University, one of two representatives participating from UNCG in this premier invite only competition. Imani Barnes – Imani Barnes is a Social Work Major and African American Studies Minor scheduled to graduate this Spring with a 3.5 GPA. Upon completing her certifications for waxing, facials, massages, and skin care in the Summer of 2018, Imani launched her beauty business – Glitter and Glory. Glitter and Glory offers every service in waxing. In addition to these services, she offers full-face make up beats through MadebyMani. She gives each client custom individual looks, from extensive services for special events to subtle looks for important meetings. With Glitter and Glory, Imani offers top notch services for an affordable price for both male and female clients, further seeking to educate her clients on skin care, exfoliation, and waxing. Before Glitter and Glory, in 2017, Imani started an on-campus initiative called The Pink Pad Project. This initiative seeks donations of feminine hygiene products that are sorted into mini care packages for less fortunate homeless women around the triad. Imani’s work with The Pink Pad Project has been highlighted by WXII 12 News and around UNCG’s campus, receiving Initiative of the Year recognition from Student Government Association. Outside of her philanthropic and entrepreneurial endeavors, Imani is part of many on campus organizations geared towards scholarship, business, brotherhood, and sisterhood including the Professional Business Fraternity Alpha Kappa Psi and The Nu Rho Chapter of Alpha Kappa Alpha Sorority. Khari & Omari Bodrick – The twin brothers Khari and Omari Bodrick are two young designers who have always had a passion for creating unique street-wear. They are both studying Business Administration and Entrepreneurship and scheduled to graduate in Spring 2020. In 2014, they founded ICE Clothing, a street-wear brand originating from Charlotte. The brand provides unique and affordable mix of graphic tee’s, hoodies, hats, leggings, tank tops, shorts and more, giving clients a lifestyle that reflects the urban community and culture. Over the years, ICE has accumulated over 20,000 followers on social media, have sold out all 8 of their collections, host 5-10 pop-up shops per year across NC and now print their own merchandise and ship between 20-30 orders a week. ICE also hosts an annual Thanksgiving giveaway to the homeless and shelter volunteer event, providing hoodies and hats for those in need to stay warm during the cold months. While operating ICE, these brothers have earned Deans list recognition, interned at Ink Floyd and Closer Look Publishing, participated in UNCG’s Entrepreneurship Everywhere event and were honored as Business of the Year at East Mecklenburg high school 2015. Joshua Leeper – Joshua Leeper is a full-time student, maintaining a 4.0 GPA in his 2nd Semester of UNCG’s Nonprofit Management Certificate Program while also serving as the Founder and Executive Director of Raise ‘Em Up Mentoring. Raise ‘Em Up Mentoring is a 501(c)(3) tax-exempt nonprofit formed in 2016 that takes college students from local Universities and places them in Title 1 schools to provide trained mentorship to K-12 students. The organization has recorded over 1,000 service hours while maintaining on average 30 volunteers and is currently working with 4 schools in Guilford County. In the next year, Joshua looks to expand the organization into more schools and begin writing a curriculum to be inserted into schools. Joshua has also created the event ‘Cultural Experience Day’ at UNCG. The goal is to encourage high school students to further their education, get a realistic depiction of college life for a person of color before they attend and encourage them to follow their dreams. Joshua was also one of 6 student leaders at UNCG who planned and executed the Spartans Take DC initiative, consisting of over 90 UNCG students and faculty who took an educational trip to Washington, D.C. for the 20th anniversary of the Million Man March. Joshua also works as Teacher Assistant at Casa Esperanza Montessori Charter School in Raleigh, NC. He has previously served as an AmeriCorps VISTA, been awarded the Community Impact Award by North Carolina Campus Compact, a Humanitarian Award for his leadership and commitment to service, served as President of UNCG’s Black Business Student Association, President of UNCG’s American Marketing Association, EUC Facility Manager, and OLSL Civic Engagement Fellow. Taylor Mabe – Taylor Mabe is a Fall 2018 Graduate of the Joint School of Nanoscience and Nanoengineering PhD in Nanoscience Program, maintaining a 4.0 GPA during his tenure and publishing 7 peer-reviewed journal articles and 1 book chapter. Taylor currently serves as the President and CEO of the medical device start-up 3i Nanotech, Inc, founded in 2018, commercializing innovative intellectual property generated during his PhD studies at the Joint School. His device is a platform technology for using blood for point-of-care sensing in a prehospital setting with the goal of facilitating early diagnosis of disease. 3i Nano has raised significant non-dilutive capital, starting with $5k by first participating in the Greensboro NSF I-Corps Program as Team 1 in Cohort 1. Upon successful customer validation, 3i Nano was awarded $50k and selected to participate in the 2018 NSF I-Corps National Node Program as Team 1211 where they were further awarded the “Spirit of iCorps Award” for exceptional performance and use of resources, the only team receive an award. This success led Taylor and 3i Nano to successfully receive a $75k NC Biotechnology Center Technology Enhancement Grant to further improve their innovation. This built the foundation for 3i Nano to be selected as UNCG’s 2018 Recipient of the Next Steps Program Grant, allowing them to participate in First Flight Ventures Liftoff Program for assistance in applying for a National Science Foundation Small Business Innovation Research Grant. Submitted in December 2018, 3i Nano has received positive feedback that they will likely receive this SBIR grant of over $250k, further matched by upwards of $50k in funding through the One NC Small Business Program, to build a market-ready prototype of their medical device, bringing their total non-dilutive funding raised to upwards of $430k. Taylor was also accepted to present at the CED Life Science Conference in February 2019 and pitched at Launch Greensboro’s Capital Connects in March 2019. Outside of 3i Nano, Taylor founded, created, directed and produced the JSNN Video Tutorial Series to train 1st and 2nd year students how to operate the scientific and analytical equipment at JSNN. He was the Popular Vote Winner of the Journal of Visualized Experiments worldwide “Film Your Research” contest in 2017, 1st Place Winner of UNCG 3 Minute Thesis in 2017, 1st Place National Prize Winner of the National Nanotechnology Initiative Nano Film Contest in 2017, 1st Place Winner of the UNCG Research and Creativity Expo in both 2016 and 2017, Winner of the Graduate School’s Summer Research Fellowship Award in both 2016 and 2017, 1st Place Winner of the UNCG 2 Minutes to Win It business pitch contest in 2014, 3rd place in 2015, and 2nd place in 2016. In 2015, Taylor gave a TED Talk at TedX Greensboro titled “Small Particles for Big Problems” and was also selected as the sole UNCG student to share his dissertation research with the N.C. General Assembly at Legislative Graduate Day this past year.